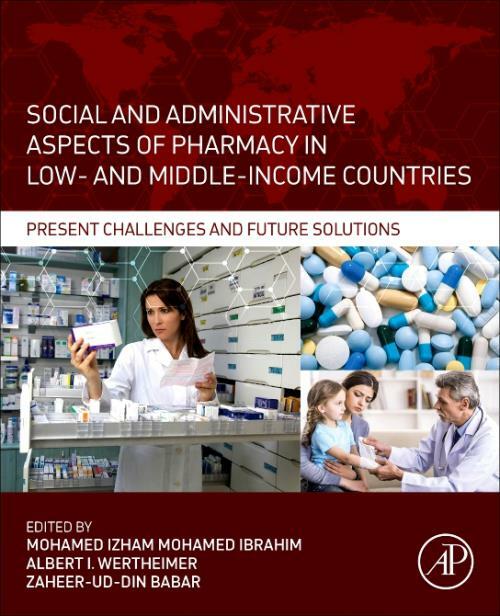 Social and Administrative Aspects of Pharmacy in Low- and Middle-Income Countries: Present Challenges and Future Solutions examines the particularities of low- and middle-income countries and offers solutions based on their needs, culture and available resources. Drawing from the firsthand experience of researchers and practitioners working in these countries, this book addresses the socio-behavioral aspects of pharmacy and health, pharmacoeconomics, pharmaceutical policy, supply management and marketing, pharmacoepidemiology and public health pharmacy specific to low- and middle-income countries. While some practices may be applied appropriately in disparate places, too often pharmacy practice in low- and middle-income countries is directly copied from successes in developed countries, despite the unique needs and challenges low- and middle-income countries face. Dr Mohamed Ibrahim is a Professor of Social and Administrative Pharmacy at College of Pharmacy, Qatar University. He obtained his PhD degree in Pharmacy Administration from the Philadelphia College of Pharmacy & Science (PCPS), Philadelphia, USA in 1995. He was a founding Program Chairman for Social & Administrative Pharmacy Program. He also served as founding Chairman, Department of Pharmacy Practice, Al Qassim University, KSA and founding Assoc. Dean of Research & Graduate Studies Affairs, College of Pharmacy, Qatar University. He was formerly a Professor at School of Pharmaceutical Sciences, Universiti Sains Malaysia and College of Pharmacy, Qassim University, Al-Qassim, KSA. His areas of research, publication and consultancy are in the area of Social & Administrative Pharmacy that focus on Pharmaceutical Policy & Supply Management, Pharmacoeconomics, Pharmacoepidemiology, Socio-behavioral Aspects of Pharmacy, and Pharmaceutical Management & Marketing. Dr. Mohamed Ibrahim has supervised and/or participated in the training of over 70 MSc and PhD graduate students from 14 countries in Africa and Asia. He has published over 250 peer-reviewed papers, multiple proceedings, monographs, research reports and other publications, including authoring or editing 12 books and multiple book chapters.. He is a co-editor of Pharmacy Practice in Developing Countries: Achievements and Challenges (Elsevier, 2016). He is part of the editorial board member and reviewers in many peer review international journals. Dr. Mohamed Ibrahim has presented more than 100 invited presentations, and is the recipient of 9 international, 18 national and 11 university research grants, and is also the recipient of 2015 Scopus Medical & Health Science Scientist Award. He has functioned in multiple consultant roles to government in Malaysia, Sudan, Mongolia, Qatar, and non-governmental bodies at national and international levels (WHO, HAI). Albert I Wertheimer is a professor of pharmacy economics at Nova Southeastern University (NSU) in Fort Lauderdale, Florida, USA. Previously, he was a professor at Temple University, and at the University of Minnesota, and the Dean at the Philadelphia College of Pharmacy. He earned his pharmacy degree at the University of Buffalo, his MBA at the State University of New York at Buffalo, and his PhD from Purdue University. He was also a postdoctoral fellow in the Social Medicine Department of St. Thomas' Hospital Medical School, University of London.He is the author or co-author of 35 books, many book chapters and about 430 articles in scientific and professional journals. He is the editor of the Journal of Pharmaceutical Health Services Research. He has advised 90 PhD graduates and more than that number of Masters degree students. In addition, he has been the advisor of about 15 postdoctoral research fellows. Dr. Wertheimer has lectured or consulted in about 70 countries. He received the research achievement award from the American Association of Pharmaceutical Scientists, is a fellow of the International Pharmacy Federation (FIP) and is a Scheele Laureat from the Swedish Academy of Pharmaceutical Sciences. He is peer reviewer for about 20 journals and on the editorial board of three. He holds adjunct appointments at Pharmacy faculties in Malta, China, Turkey, Taiwan. Slovenia, and Mexico. Currently, he is working in the area of health policy analysis. Zaheer-Ud-Din Babar is Professor in Medicines and Healthcare at the Department of Pharmacy, University of Huddersfield, United Kingdom. He is globally recognized for his research in pharmaceutical policy and practice, including the quality use of medicines, clinical pharmacy practice, access to medicines and issues related to pharmacoeconomics. Previously he was the Head of Pharmacy Practice at School of Pharmacy, Faculty of Medical and Health Sciences, University of Auckland, New Zealand. A pharmacist by training and a Ph.D. in pharmacy practice, Dr. Babar is the recipient of prestigious "Research Excellence Award from the University of Auckland. He has active research collaborations and linkages in over 30 countries including in World's leading Universities such as Boston University School of Public Health, Harvard Medical School, Austrian Health Institute, University of Auckland, Monash University and at the University of Sydney. He has published over 150 papers, book chapters, conference papers including in high impact journals such as PLoS Medicine and in Lancet Oncology. Dr. Babar has acted as an advisor for World Health Organization, Health Action International, the International Union Against Tuberculosis and Lung Disease, World Bank, International Pharmaceutical Federation (FIP) and for the Pharmaceutical Management Agency of New Zealand. His recent work includes a number of high-quality books including "Economic evaluation of pharmacy services", Pharmaceutical prices in 21st century, " Pharmacy Practice Research Methods and "Pharmaceutical policies in countries with developing healthcare systems. Published by Elsevier and Adis/Springer, the work is used in curriculum design, policy development and for referral all around the globe. He is the Editor in Chief of Encyclopedia of Pharmacy Practice and Clinical Pharmacy, which is due to be published by Elsevier in early 2019.The Encyclopedia is comprehensive in nature and it aims to cover multiple stream and domains including pharmacy practice, sociobehavioural, and administrative pharmacy, pharmacoepidemiology, clinical pharmacy and therapeutics and issues related to pharmacy education, professional standards, and workforce.